Frederick Nolting (August 24, 1911 – December 14, 1989) was a United States diplomat who he served as United States Ambassador to South Vietnam from 1961 to 1963. Frederick Ernest Nolting, Jr. was born in Richmond, Virginia to Frederick Ernst Nolting, Sr., and his wife, the former Mary Buford. Nolting, Jr. graduated from the University of Virginia in 1933, where he was a member of the Virginia Glee Club, with a B.A. in History. He then received a master's degree from Harvard University in 1941 and his Ph.D. from the University of Virginia. Frederick Nolting joined the State Department in 1946 where he acted as special assistant to Secretary of State John Foster Dulles for mutual security affairs. He was appointed as a member of the United States delegation to the North Atlantic Treaty Organization (NATO) in 1955. In 1957 he was appointed by President Dwight D. Eisenhower as alternate permanent representative to NATO, and in 1961 he was appointed by President John F. Kennedy as United States Ambassador to South Vietnam. 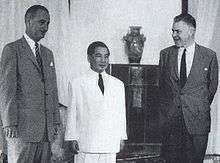 Nolting was a firm supporter of South Vietnamese President Ngo Dinh Diem to the point where, by 1963. Following his government service, Nolting went to work for Morgan Guaranty Trust Company, and in 1970 joined the faculty of the University of Virginia and became founding director of the Miller Center of Public Affairs. In 1988 he published his memoir From Trust to Tragedy: The Political Memoirs of Frederick Nolting, Kennedy's Ambassador to Diem's Vietnam. Nolting married Olivia Lindsay Crumpler in 1940. They had four children – Molly, Jane, Grace and Frances. In 1946, he purchased "Sully", the former estate home of Richard Bland Lee, first Congressman from Northern Virginia, built in 1794. He was the last private owner of that estate. Nolting died on December 14, 1989, aged 78, in Charlottesville, Virginia. He was buried at St. Paul's Churchyard, Ivy, Albermarle County, Virginia. ↑ Corks and Curls. 1934. p. 157.